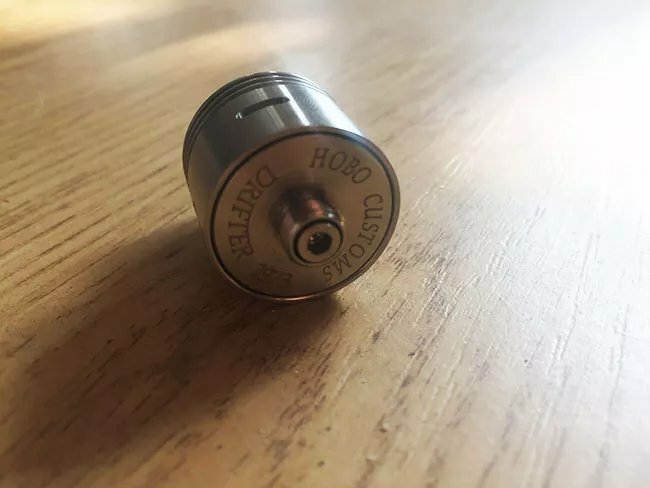 Manufactured by Hobo Customs in the United States, the Hobo Drifter RDA is the follow up to the successful Hobo 3.1 RDA, and features a 3D machined airflow which uniquely forces airflow up from under the coil, which noticeably increases smooth flavour production and decreases the risk of leaking, and the cap design ensures minimal spitback. It offers single as well as dual coil airflow options, and has been manufactured to the highest possible standards. There’s a deep juice well present too with a small low profile overall RDA size. You don’t get a box as such, the Hobo Drifter comes in a smart hessian drawstring pouch, which is a nice little touch and in line with the Hobo styling. You also get spare o-rings, spare screws and an Allen key for the post screws as well. 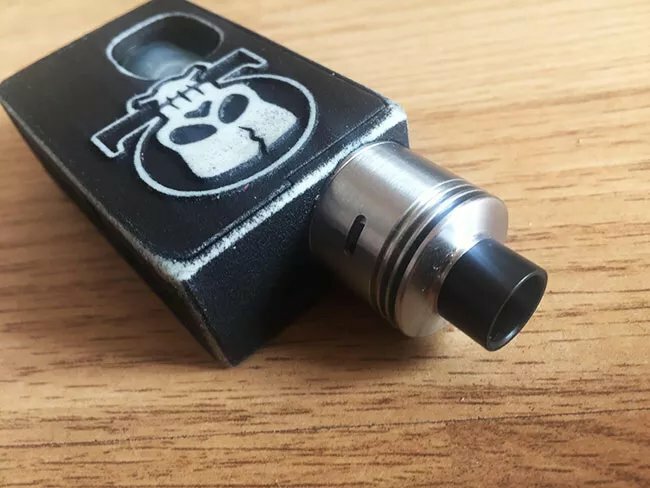 Sporting a low profile, measuring only 21mm from the base to the tip with a 22mm diameter, the Hobo Drifter sports sleek and understated looks, with no visible logos on the top cap, and it’s a lovely fit for pretty much any mod you put it on. 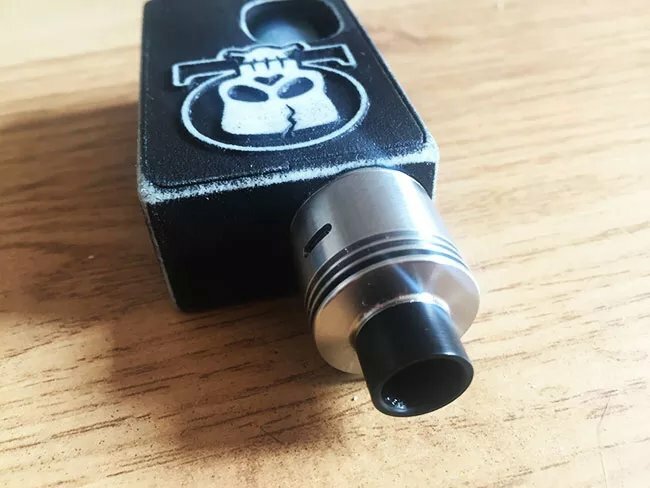 It’s manufactured from 316 Stainless Steel, with a deep 7mm juice well, and there are three heat fins present on the top cap to aid with heat dissipation. The drip tip has a 7mm bore and is 510 threaded too so that you can swap it out for a different drip tip if you wish to do so. At the base of the Hobo Drifter you’ll see ‘Hobo Customs Drifter’ engraved on, along with your individual serial number. 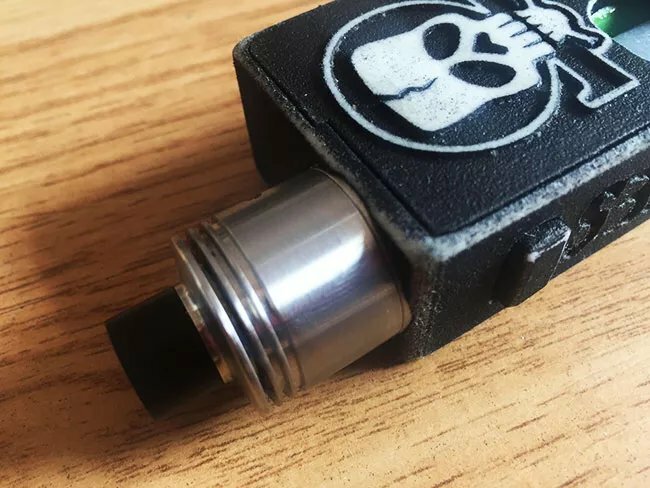 The adjustable 510 pin is made from copper to maximize conductivity, and this can be swapped out (along with the positive block on the build deck) for a bottom feed pin so that you can use your Hobo Drifter with a squonker. Overall the build quality of the Hobo Drifter is outstanding, and it’s a great looking little RDA as well. The machining is top notch, with no sharp edges or burrs, and the top cap slots onto the base of the tank perfectly. It’s a very well made and very well designed bit of kit, that is for sure! On the top cap of the Hobo Drifter, there are three large slots cut out that each measure in at 6mm x 2mm each. 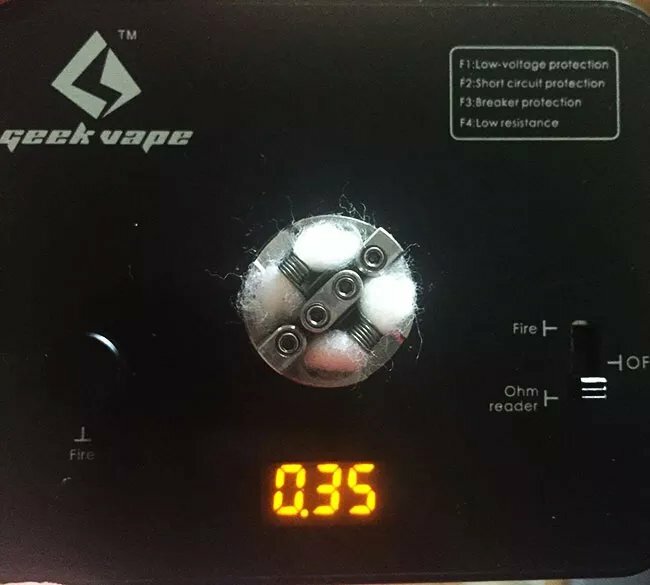 You can align two of these with the 3D machined airflow cut outs on the deck if you are using a dual coil build, or just the one if you are using a single coil, and airflow will be drawn through the holes, up through the 3D machined airflow cut outs to hit your coil from underneath. Adjusting the airflow is done via rotating the top cap, and once set in place the airflow setting will stay where it is. The reasonably large airflow slots do offer quite an airy lung hit when fully open, with dense clouds of vapour, and the airflow can be dialled right down for a restricted hit, I have achieved a mouth to lung vape with a single coil albeit a loose one at that! You’ll find a four post build deck here, with a split positive centre post, and the negative posts have a shelf styled clamp design, where your coil legs slot into and are clamped down by grub screws, which seat slightly lower than the post holes in the positive centre block to make for a slightly easier build. The negative clamps can be a bit of a pain sometimes to slot the coil legs into, and the small size means you aren’t going to get big and thick coils slotted in here. The juice well is 7mm deep which gives you a nice reservoir of juice, and the overall size of the deck is pretty big. Single and dual coil builds are compatible with the Hobo Drifter, and the trick to getting the very best out of this atty is to position your coils as close to the airflow cut outs on the deck as possible, and leave those cut outs unobstructed of wicking material. This means that as much air as possible hits the base of the coils, and provides the best flavour and vapour this RDA has to offer! The Hobo Drifter is a flavour chasers dream, this provides some of the smoothest and best flavour I have experienced yet. As long as you have the coils positioned correctly, this RDA provides incredible depth of flavour, bringing out notes in your juices that you didn’t realise were there before. 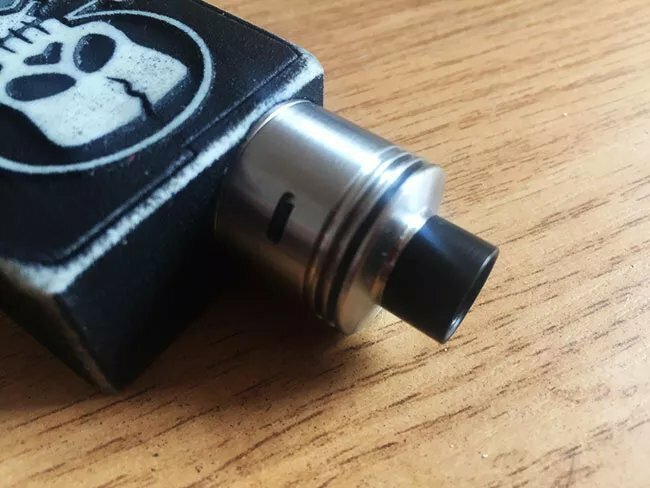 I also found that even though I run pretty low resistance nichrome builds in the Hobo Drifter, to use with mechanical squonking mods, the top cap doesn’t seem to get overly hot either, meaning the PEEK insulators and heat fins on the top cap must be doing their job! Although the Hobo Drifter is more of an RDA aimed at flavour chasers, it can certainly hold its own when it comes to vapour production. Alongside it’s ultra smooth draw it is still capable of chucking out some big satisfying clouds of thick and tasty vapour, and it’s certainly not to be sniffed at. With the airflow wide open it does provide a nice and loose lung hit and plenty of cloudage to match! The Hobo Drifter has quickly become a favourite of mine, and an atty I take out with me and use on a day to day basis. I can’t fault the performance of it, the draw is right up my street with an incredibly smooth and flavoursome draw, and an immensely satisfying amount of vapour. The build quality is amongst the best I have experienced with an RDA too, machined to almost absolute perfection. The only minor negative was the fiddly negative posts, but you will get used to those within a couple of builds. All in all, there isn’t really anything else negative I could find with the Hobo Drifter, it is truly an outstanding RDA. 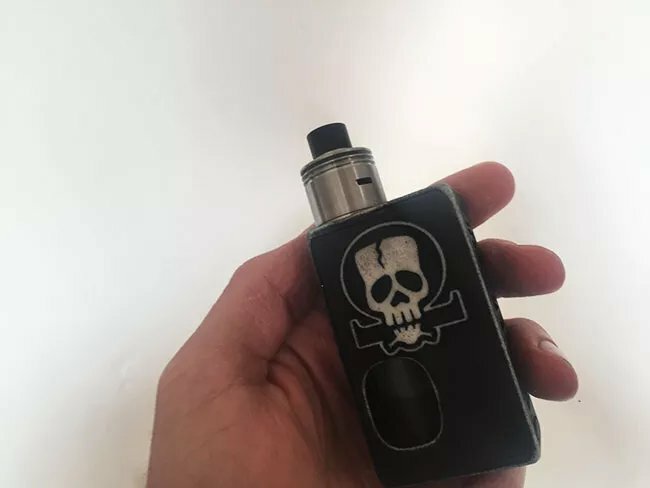 In particular, it’s become one of my favourite RDA’s to use when squonking, the bottom feed pin works very well with the Hobo Drifter and helps ensure juice travels from my bottle up to my deck with ease, and I almost exclusively use my Hobo Drifter for squonking. In my opinion, it’s one of the best atomisers out there for that purpose! 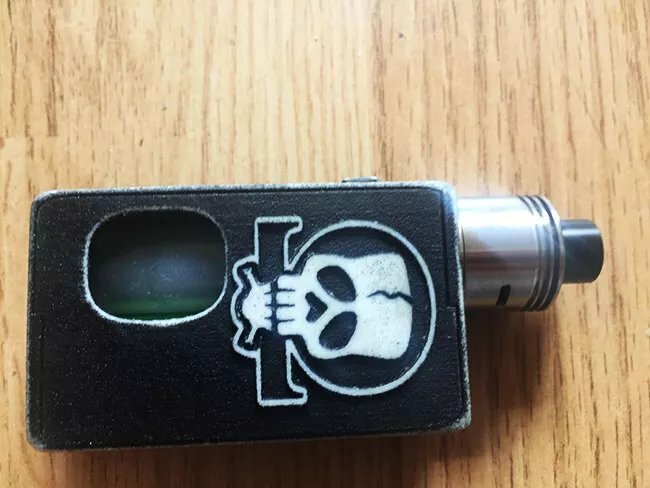 The Hobo Drifter is available from www.custom-vapes.co.uk, you can also purchase the BF pin kit as well from there to make your Hobo Drifter compatible with a squonker, and spare grub screw packs are also available too.